The Perioperative Surgical Home has been promoted as a novel, clinician-championed yet institution-supported, well-coordinated and very patient-centered, interdisciplinary model of care. Major forces are mandating a shift in the way providers and hospitals are paid from the traditional volume-based, fee-for-service contracts to one predominately linked to the value of the care. There are a number of drivers of health care value, which collectively represent a “burning platform” that will necessitate a fundamental change—a “New Frontier”— in perioperative care delivery and payment models in the USA. The highly collaborative Perioperative Surgical Home can consistently and effectively guide the patient through the entire surgical continuum, from the initial decision to undergo surgery to the post-hospital discharge and rehabilitation phase. The Perioperative Surgical Home essentially seeks to maximize health care value, defined as a quotient whose numerator includes perioperative quality, safety, and satisfaction and whose denominator is the total cost of perioperative care. 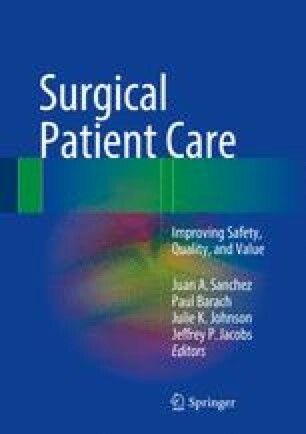 There is an existing and a growing body of the literature supporting implementation and sustaining Perioperative Surgical Home model. Stiefel M, Nolan K. A guide to measuring the Triple Aim: population health, experience of care, and per capita cost. IHI Innovation Series White Paper. 2012. www.IHI.org. Accessed 30 Oct 2013. Health Care Cost Institute. Health care cost and utilization report: 2011/2012. http://www.healthcostinstitute.org/files/HCCI_HCCUR2011.pdf. Accessed 1 Oct 2013. Evans M. Major providers, insurers plan aggressive push to new payment models. Modern Healthcare. 2015. http://www.modernhealthcare.com/article/20150128/NEWS/301289934/major-providers-insurers-unite-to-shift-more-business-to-quality-of-care. Services CfMM. Bundled Payments for Care Improvement (BPCI) initiative: general information. Baltimore, MD: Department of Health and Human Services; 2015. https://innovation.cms.gov/initiatives/bundled-payments/. Centers for Medicare & Medicaid Services. CMS finalizes bundled payment initiative for hip and knee replacements. Washington, D.C.: U.S. Department of Health & Human Services; 2015. http://www.hhs.gov/about/news/2015/11/16/cms-finalizes-bundled-payment-initiative-hip-and-knee-replacements.html. Agency for Healthcare Research and Quality (AHRQ). Your guide to choosing quality health care. Rockville, MD; 2003. See https://archive.ahrq.gov/consumer/qnt/. Skinner J, Fisher E. Reflections on geographic variations in U.S. health care. 2010. [1–21 pp.]. http://www.dartmouthatlas.org/downloads/press/Skinner_Fisher_DA_05_10.pdf. Accessed 13 Apr 2016. Institute for Healthcare Improvement (IHI). IHI announces that hospitals participating in 100,000 lives campaign have saved an estimated 122,300 lives. Cambridge: IHI. See: http://www.ihi.org/about/news/Pages/IHIAnnouncesHospitalsin100000LivesCampaignSaved122300Lives.aspx; http://www.ihi.org/about/news/Documents/IHIPressRelease_Hospitalsin100000LivesCampaignHaveSaved122300Lives_Jun06.pdf.